Sylvia Constanca Romano who was abducted by gunmen in Kilifi County in 2018. Police have refuted claims that Italian volunteer Sylvia Romano, 23, who was abducted last year has been taken to Somalia. Coast Regional Police Commander Marcus Ochola said Ms Romano -- who was abducted on November 20, 2018 in Malindi, Kilifi County -- is still in the country. Her whereabouts is still unknown two months after her abduction. Speaking during a briefing in Mombasa on Saturday, Mr Ochola said an operation to trace the missing woman is still ongoing. "We are following up some leads to rescue her and arrest the abductors. We appeal to the public to cooperate with us by giving us critical information," Mr Ochola said. "Our operation is guided by intelligence information that we are getting from the public. We promise confidentiality. Give us vital information to manage security in this region," he appealed. Mr Ochola is optimistic that the operation to rescue Ms Romano will be successful. Earlier, police said the harsh weather conditions and poor communication network was hampering the rescue efforts. A multi-agency security team comprising of police and army officers has sealed off Boni Forest and the areas bordering Lamu, Garissa and Tana River counties as the hunt for the bandits continues. In November last year, police offered a Sh3 million reward for information on three key suspects in the abduction. In a statement, the National Police Service identified the three as Mr Ibrahim Adan Omar, Mr Yusuf Kuno Adan and Mr Said Adan Abdi. A Sh1 million bounty was placed on each of them. 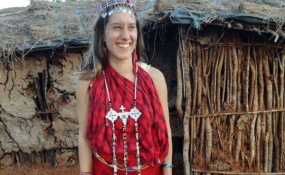 Ms Romano was a volunteer with Italian charity Africa Milele Onlus.